Heidelberg, Germany, March 27, 2019 – Affimed N.V. (Nasdaq: AFMD), a clinical stage biopharmaceutical company committed to giving patients back their innate ability to fight cancer, today provided an update on recent operational progress and reported financial results for the year ended December 31, 2018. Data from an investigator-sponsored translational Phase 1b/2a study of AFM13 in patients with relapsed or refractory CD30-positive lymphoma with cutaneous manifestation led by Columbia University were presented at the 60th American Society of Hematology (ASH) Annual Meeting and Exposition in December 2018. The data confirmed single-agent activity of AFM13 in CD30-positive lymphoma patients. In addition, an analysis of biomarker correlatives showed a temporary decrease in circulating NK cells during therapy, with post therapy recovery. Tumor biopsies showed increased infiltration of CD56+ NK cells in responders compared to non-responders. Affimed provided an update on its Phase 1b trial of AFM13 in combination with pembrolizumab in patients with HL. Data from 24 patients showed that the combination of AFM13 and pembrolizumab could be safely administered and achieved objective response and complete response (CR) rates that compare favorably to the historical data of pembrolizumab in a similar patient population, with the CR rate approximately double that of pembrolizumab. The data was presented at the ASH Annual Meeting 2018. An oral presentation by MDACC at the ASH Annual Meeting 2018 described the successful development of a novel premixed product of expanded allogeneic cord-blood derived NK cells preloaded with AFM13 to redirect the specificity of NK cells against CD30-positive malignancies in preclinical models, as well as in vivo data confirming the antitumor activity of these AFM13-NK cells. Based on preliminary feedback from the U.S. Food and Drug Administration (FDA) and on data presented at the ASH Annual Meeting 2018, Affimed announced plans at the Company’s Research & Development Day in December to pursue a registrational pathway for AFM13 monotherapy in relapsed or refractory patients with PTCL and TMF with potential for accelerated approval. The broader clinical development strategy for AFM13 includes potentially expanding into other CD30-positive lymphoma indications and additional treatment lines with significant unmet need. In collaboration with strategic partners, Affimed plans to investigate AFM13 in combination with other immunotherapy agents, such as an anti-PD-1/PD-L1 antibody agent and with adoptive NK cell transfer. Together with its collaboration partners from Washington University School of Medicine, Saint Louis, MO, Affimed will present data at the AACR Annual Meeting 2019, aimed at describing NK cell functional responses to tumor cells triggered by AFM13. Innate cell engagers developed from Affimed’s ROCK® (Redirected Optimized Cell Killing) platform enable targeting of clinically validated tumor antigens, such as EGFR, for which current therapies have shown limited efficacy due to resistance and/or dose-limiting toxicities. AFM24, designed to treat patients with a variety of EGFR-expressing solid tumors, has the potential for broader efficacy through higher potency at both high and low EGFR expression levels and in KRAS mutant tumors, as well as a more favorable safety profile as compared to current therapeutic anti-EGFR monoclonal antibodies. Affimed will present data at the AACR Annual Meeting 2019 that highlights the differentiating features of AFM24 versus standard of care anti-EGFR therapies, such as cetuximab, including tumor cell killing independent of RAS mutational status, induced tumor lysis through antibody-dependent cellular cytotoxicity (ADCC) and antibody-dependent cellular phagocytosis (ADCP), as well as toxicology studies demonstrating a favorable safety profile. Preliminary data on the clinical activity and safety of AFM11 from a Phase 1 study of AFM11 in relapsed/refractory acute lymphoblastic leukemia (ALL), including several patients with complete remissions, were presented at the ASH Annual Meeting 2018. Affimed recently submitted a complete response document to the FDA that summarizes the clinical data from the two AFM11 Phase 1 studies with a request that the clinical hold be lifted so that clinical development of AFM11 may proceed in patients with ALL. In February, Affimed raised approximately $24.5 million (€19.7 million) in net proceeds from an underwritten public offering. In March, Leila Alland, M.D. joined Affimed as Chief Medical Officer. Dr. Alland brings more than 20 years of oncology experience, having held leadership roles in drug development at Tarveda Therapeutics, AstraZeneca, Bristol-Myers Squibb and Novartis. In May, Affimed introduced its ROCK® (Redirected Optimized Cell Killing) platform. The Company’s proprietary, unique and fit-for-purpose ROCK® platform enables the generation of first-in-class, tetravalent, multi-specific immune cell engagers. Based on its modularity, ROCK® allows for antibody engineering of highly customizable innate and T cell engagers to generate clinical candidates tailored to multiple disease indications and settings, including generation of molecules against validated oncology targets, to address the limitations of existing treatments. In August, Affimed entered into a research collaboration and license agreement with Genentech, a member of the Roche Group, to develop and commercialize novel NK cell engager-based immunotherapeutics based on Affimed’s ROCK® platform to treat multiple cancers. Affimed received $96 million in upfront and committed funding, and may be eligible to receive up to an additional $5 billion including payments on achievement of certain development, regulatory and commercial milestones, plus royalties on sales. In March 2019, Affimed announced that it will receive a payment in an undisclosed amount triggered by the achievement of a preclinical milestone under its collaboration with Genentech. 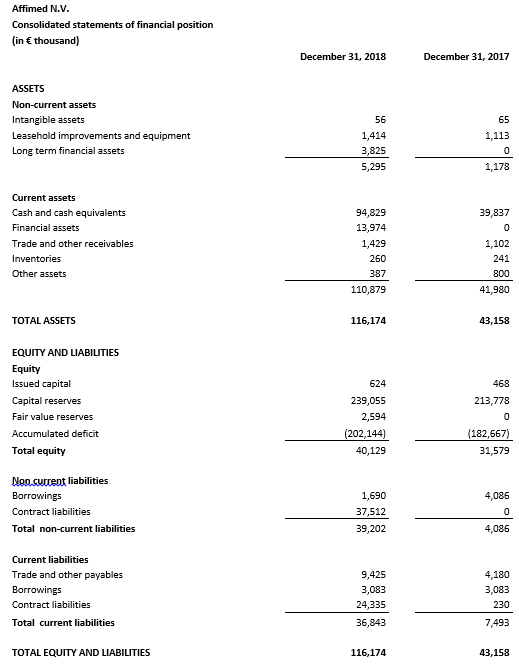 Cash, cash equivalents and current financial assets totaled €108.8 million as of December 31, 2018 compared to €39.8 million as of December 31, 2017. Affimed anticipates that its cash, cash equivalents and current financial assets as of December 31, 2018 will enable the Company to fund its operations, including clinical development and early development activities, into 2021 assuming all of the Company’s programs advance as currently contemplated. 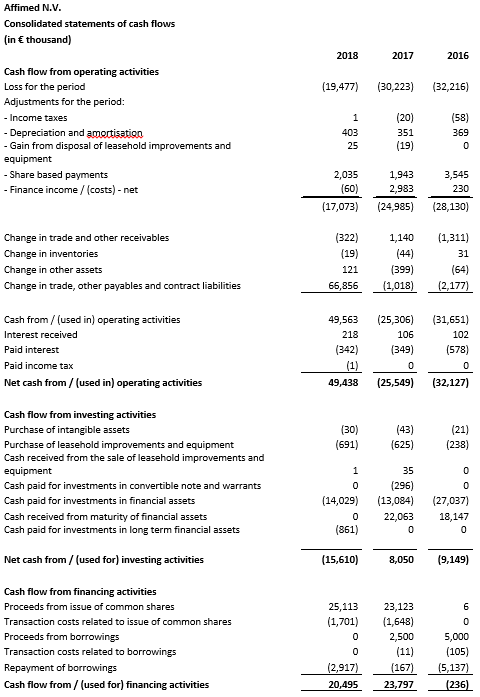 Net cash from operating activities was €49.4 million for the twelve months ended December 31, 2018 compared to net cash used in operating activities of €25.5 million for the twelve months ended December 31, 2017. The amount in 2018 includes an initial upfront payment and committed funding of €83.2 million from the Genentech collaboration. Affimed recognized €21.8 million as revenue from the Genentech collaboration in 2018 and €61.4 million under contract liabilities, which will be recognized as revenue in subsequent periods. Total revenue was €23.7 million for the year ended December 31, 2018 compared to €2.0 million for the year ended December 31, 2017. Research and development (R&D) expenses were €35.1 million for the year ended December 31, 2018 compared to €21.5 million for the year ended December 31, 2017. The increase was related to higher expenses for AFM13 and AFM11 clinical development activities, as well as early stage development and discovery activities. General and administrative (G&A) expenses were €9.6 million for the year ended December 31, 2018, compared to €8.0 million for the year ended December 31, 2017. This increase was primarily related to higher legal and consulting expenses. 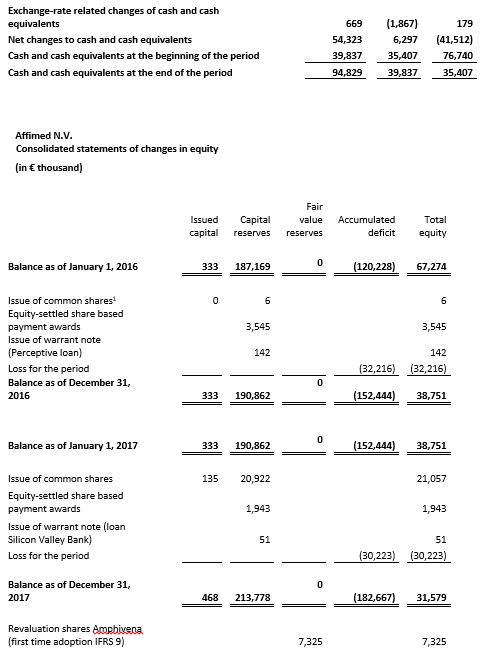 Net loss was €19.5 million, or €0.32 per common share, for the year ended December 31, 2018, compared to a net loss of €30.2 million, or €0.69 per common share, for the year ended December 31, 2017. 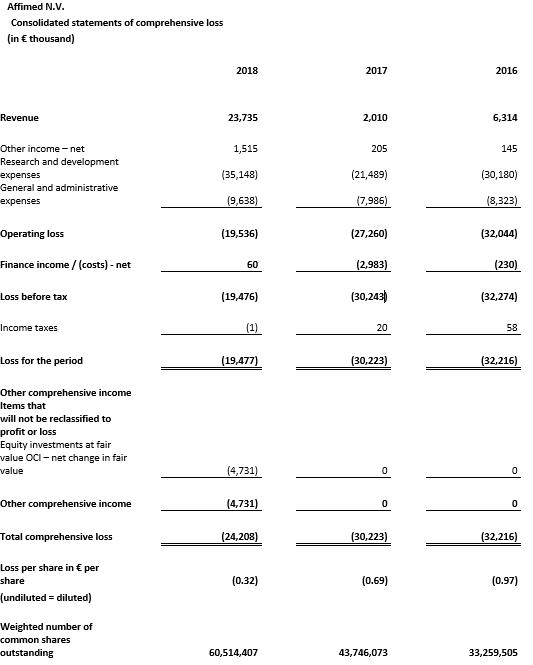 The decrease in net loss was primarily related to significantly increased revenue, partially offset by higher spending on R&D and G&A expenses. 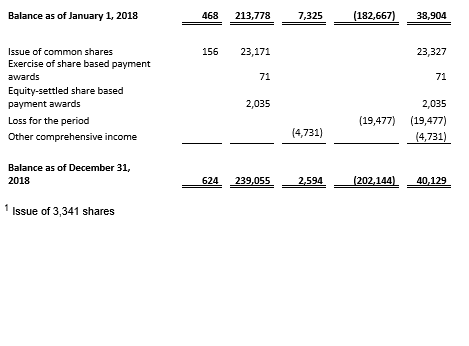 Additional information regarding these results is included in the notes to the consolidated financial statements as of December 31, 2018 and “Item 5. Operating and Financial Review and Prospects,” which will be included in Affimed’s Annual Report on Form 20-F as filed with the U.S. Securities and Exchange Commission (SEC). Affimed will host a conference call and webcast today, Wednesday, March 27, 2019 at 8:30 a.m. Eastern time to discuss the Company’s financial results and recent corporate developments. To access the call, please dial +1 (631) 510-7495 for U.S. callers, or +44 (0) 2071 928000 for international callers, and reference conference ID 5559486 approximately 15 minutes prior to the call. An audio webcast of the conference call can be accessed in the “Webcasts” section on the “Investors” page of the Affimed website at https://www.affimed.com/investors/webcasts/. A replay of the webcast will be available on Affimed’s website shortly after the conclusion of the call and will be archived for 30 days following the call. Affimed (Nasdaq: AFMD) is a clinical stage biopharmaceutical company committed to giving back patients back their innate ability to fight cancer. Affimed’s fit-for-purpose ROCK® platform allows innate immune engagers to be designed for specific patient populations. The Company is developing single and combination therapies to treat cancers. For more information, please visit www.affimed.com.